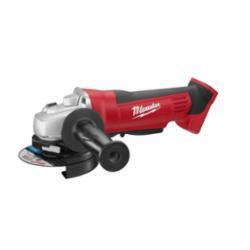 The M18® Cordless LITHIUM-ION 4-1/2 in Cut-off / Grinder provides speed, durability and ease-of-use to the industrial user. Built with a Milwaukee® 4-pole motor, the 2680-20 delivers maximum power when cutting or grinding. The 2680-20 is the only cordless cut-off / grinder in the market to provide the user-preferred paddle switch for comfort and ease-of use when operating in various positions. L-shape intake vents protect the cut-off / grinder by keeping harmful debris from entering the tool and damaging internal components.